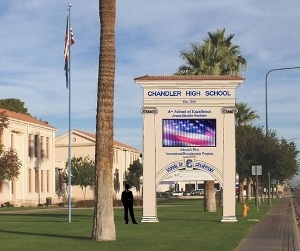 Chandler High School, located in historic downtown Chandler, will celebrate its 100th anniversary this coming school year. In preparation for its centennial celebration, Freedom Circle is being constructed on the school's front lawn. Ready to greet students in the fall, Freedom Circle will include a new marquee sign and landscaping along Arizona Avenue. The new marquee, complete with an electronic message center, will complement the school's classic architectural style, while the project's centerpiece will be a trio of flagpoles honoring America in a prominent way. Be sure to follow our blogs as we track the Freedom Circle Project.